The information I have on this print is that the train is the down "Irish Mail" passing Pensarn [North Wales coast between Rhyl and Colwyn Bay map] in Sept 1896. The engine is (according to what is written on the back of my print) Experiment class "Victor". An additional mystery; why so many "rights of way" as indicated by white painted fencing over the embankment to the left; at least seven can be seen on my print. There are no sleepered crossings in view for pedestrians. I think the two "mystery posts" are there to attach stabilizing wires from the signal situated between the tracks. Another one can be seen on the opposite embankment. 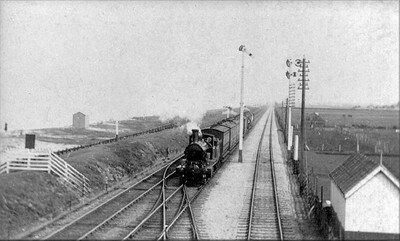 This certainly looks very like Pensarn - taken from the footbridge a quarter-mile east of Abergele station. The 34 (from Chester) milepost might be visible on the print down by the shed on the right. The TPO carriage seems to have its pick-up net extended - for picking up somewhere near Abergele station? Can't discover when the 3rd line was laid, nor precisely when the later 4th line was added, and haven't had a chance yet to look at the relevant OS plan - which might explain (among other things) these mysterious multiple white fences. This photo is reputedly of the Down Irish Mail, taken in September 1896 near Pensarn near Abergele. The engine is one of the Experiment Class - “Victor”. The two posts on the right are there for the attachment of stabilising wires from the signal from between the tracks. Another can be seen on the up-side. Another feature is the large number of “rights of way” over the embankment on the right, (on my print - seven at least can be seen). There is no signs of sleeper crossings or stiles on the right. Are they for holiday makers to reach the beach, and if so, where are they all coming from? One can only guess at what the modern day “nanny” state would say of this! The photograph of 'Experiment' Class no. 307 Victor is taken from the footbridge at the end of Tennis Court Road. This location also appears in a photo of Columbine pulling an inspection saloon which can be found on page 223 of O.S. Nock's Premier Line. You can see they are the same by identifying the signal with guying posts and also the crossover track. The picture of Columbine is attributed to H.P. Sheddon in 1896, the same year as for Victor. Who was H.P. Sheddon and is it possible he took both photographs?